The air is palpable with words. It is book group night and the participants of B.A.B.E.S are in good form. We’re meeting for the first time at the newly renovated home of one of our members. A toasty fire is beckoning us to gather around the radiant timbers. The ‘bubbles’ are chilled – the flutes lined up in precise military lines ready to obey the ‘fill-me-up’ command. Foods designed to tempt even the most diet-resilient, lay enticingly spread before us. Our regular solving of issues big and small is only given a fleeting opportunity because we all want the discussion to begin. Her Father’s Daughter by Alice Pung has had an impact on us all. Not unlike The Joy Luck Club and Wild Swans, this memoir unravels the generational story of a family to reveal a shocking epoch in history, one that we have lived through, but if you’re like me, was dismayingly unaware of at the time. 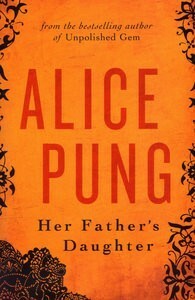 The book commences with the protagonist’s search for the family history of her Chinese Cambodian parents. Firstly set in China, links to grandparents are sought by this first generation Australian born. In addition to this, the plot reveals a father’s concern for his daughter’s welfare in regards to her safety, her career, her future. Is he being overly protective in a natural fatherly way, or is there something else causing these philosophical differences in regard to contemporary life styles? The setting then shifts to Melbourne and draws the reader into a sense of empathy about familial relationships and creates an expectation that the remainder of the story will show some resolution to this age-old dilemma. The plot, to this point does not prepare you for the following installment. I love an unexpected twist in a book, but I was not expecting to be ‘gutted’ by what I read next. It is only as we learn about the horrendous experience the family has endured in their home country of Cambodia that the banality of what we, in contemporary Australia, regard as important in our day to day life, becomes evident. Alice Pung’s language in this book is uncluttered yet masterful. Rather than retell the story (you should all read this book), I’m going to share quotes that I found poignant. My Father’s Daughter is compelling reading. Make this the next book you pick. This entry was posted in Book Groups, Books I've Read and tagged Alice Pung, book groups, Cambodia, killing fields, My Father's Daughter by wentowrite. Bookmark the permalink. I loved Alice Pung’s first book “Unpolished Gem”. I’ve been meaning to read “Her Father’s Daughter” for ages – I actually gave it to my husband (for my benefit too!) last year – so thanks for the nudge to get me to pick it up.